Dove season rolls around again. Since there’s only about three states that allow dove hunting, some of you may not get to enjoy the experience. Fortunately Virginia has allows dove hunting. The season opens in September and marks the beginning of hunting season. Squirrel season typically starts the same day. I know what you may be thinking. How much fun could dove hunting possibly be? That was my initial thought when a buddy of mine kept asking me to go. He has dove hunted before and already knew how much fun it could be. So after some arm twisting I decided to go. I grew up jump shooting grouse but dove is different. There’s much more shooting involved and, lots of misses too. I always equate dove hunting to cat fishing with out the beer. LOL It is a more social than any other form of hunting. Being quiet isn’t necessarily required. That is if you are on a field with friendly people that don’t take it to serious. Safety is still number 1. With guns involved it has to be. As I always say, “there is nothing so important to shoot that justifies an unsafe shot”. Hunting dove involves a bunch of hunters spaced out around a field just sitting and waiting for the birds to fly over. (a cut corn or sunflower) I have paced dove flying next to the road. It seems that their cruising speed is about 35 mph. It’s said that they can fly as fast as 60 mph. Opening day is the best day to go if you can find a field that isn’t overly crowded. That’s when the maximum number of birds are still on wing. The third season in December and January can also be good as the birds migrate south. Some of the largest flocks I have seen have been in the third season. At that point I am still hunting deer. As for the eating of dove… they are actually good eating. We don’t just let them lay and rot. Besides being illegal, that would be a waste of a good meal/snack. I will usually hunt that Saturday and fix dove poppers on Sunday while watching football. I will have to do a post on cooking them soon. Six is enough for a good snack. 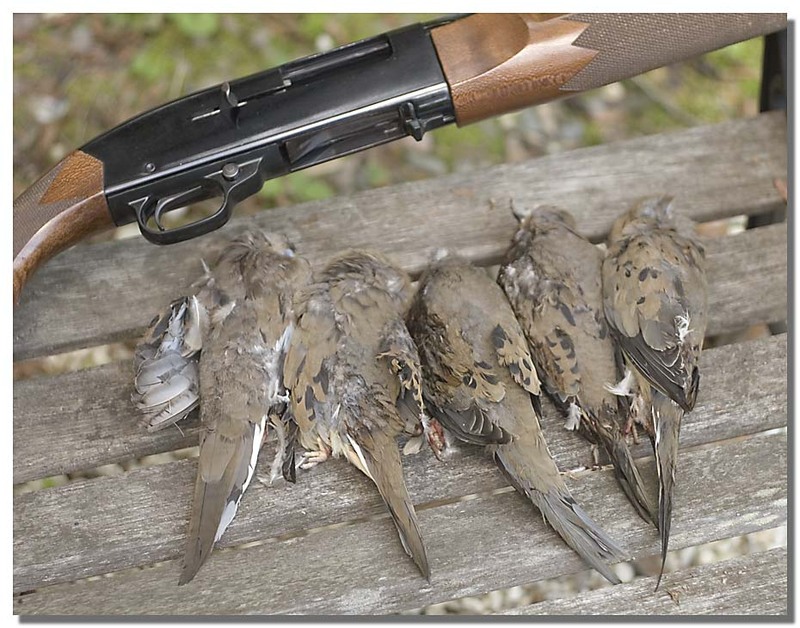 If you have never considered dove hunting, give it a try. It’s a load of fun with a tasty treat in the end. There are still a number of days left in the season currently in Virginia. If in another state be sure to check the game laws. Be safe and be legal. Happy hunting. This entry was posted in Cooking, Hunting, Survival Tactics, VaCreepingOutdoors, vacreepinoutdoors and tagged buying, dove, experience, fun, hunt, hunting, survival, vacreepinoutdoors. Bookmark the permalink. It’s definitely a social event here in Texas, signaling the oncoming fall. It’ll sometimes be in the low 100s here September 1. But I love it nonetheless. Thinking back to my introduction to dove hunting, I cant believe how resistant I was to dove hunting. Its a BLAST!!!! Ha ha I love the catfish fishing without the beer analogy. Glad to see dove hunting is still alive and well in VA. Fredricksburg sure has changed since I was last up that way, I don’t think anyone dove hunts around there anymore.